Philips 65PFL9708 review | What Hi-Fi? 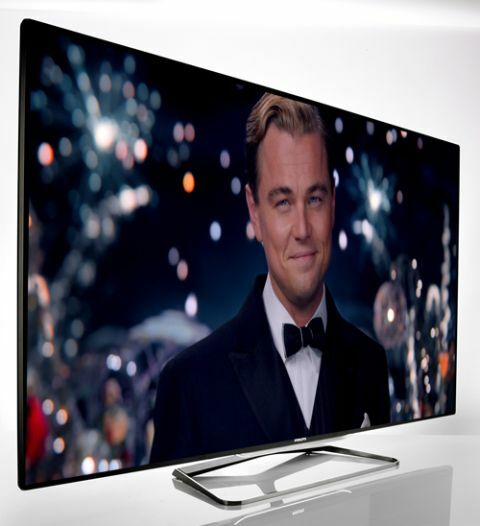 Philips has found it hard in recent years to make serious inroads into a TV market dominated by the big-hitting Korean and Japanese brands – but could the Philips 65PFL9708 4K TV change all that? This flagship Philips 4K Ultra HD TV set certainly has a picture good enough to challenge the establishment, although it takes a fair bit of tinkering to arrive at it. Working your way through its menus can be confusing and counter-intuitive at times, but persevere and the Philips really shines. 4K video looks solid and insightful. It isn’t quite as immersive as some of the best we've seen, but it’s very close. We try a native 4K clip of the Total Recall remake: there’s a great grasp of foreground detail, but even more impressive is the Philips TV’s ability to latch on to the fine detail of the buildings in the background. The Philips 65PFL9708 excels with a ‘Mastered in 4K’ Blu-ray of The Amazing Spider-Man (a Full HD movie remastered from a UHD source). The detail and texture on Spidey’s suit is crystal-clear, and low-light detail is handled expertly, with brilliantly defined edges and shadows. Blacks on some other 4K TVs are a little richer and deeper, but the Philips is great for subtlety. Pictures through the Freeview HD tuner are solid and clean. The bright, punchy colours of Strictly Come Dancing are delivered with real gusto, but they don’t burn your retinas. Watching on BBC One HD the level of detail is excellent, the screen highlighting every last seam and sequin. Drop down to standard-def images and, yes, there’s a drop in resolution, but this Philips 65in TV keeps the blueprint of the picture intact. Motion is the trickiest aspect of the Philips’ picture to dial in. Even with Perfect Natural Motion set to ‘minimum’, there’s something slightly unnatural about the image – the actors and backdrops look artificial at times. Turn it off and you sacrifice some of the smoothness, but it does make the picture more believable. Watching in 3D requires you to don a pair of passive specs (pictured below) that look more Where’s Wally? than Wayfarer, but the picture is vivid and punchy. The opening scene to Hugo has depth and detail, but motion isn’t quite as rock-solid as we've seen elsewhere. We do have a slight concern over the reflectiveness of the Philips screen. View a dark scene in a moderately lit room and you spend most of your time looking at a reflection. This could prove distracting. Sound is fair. The built-in speakers can’t match those of the Sony 4K TV, but there’s a good sense of openness and clarity here. Dialogue doesn’t sound congested and the TV doesn’t react badly when pushed a little harder. When it comes to smart features, Philips has always been playing catch-up against more impressive services from the likes of Samsung, Sony and Panasonic and although it’s slowly getting there, it isn’t as competitive as it could be – apart from a BBC iPlayer app, there are no other catch-up services to be seen.